Remember the Nokia X3-02 or the Nokia 1209? Well the Finnish company at MWC 2013 today announced the new Nokia 105 and this is most definitely back to the cheap past. The Nokia 105 was announced today at Mobile World Congress today and this has to be one of the cheapest Nokia handsets that will be available second quarter of 2013 for only â‚¬15, yes we did just say 15 Euros. This is the perfect phone for those that do not want a smartphone or all the bells and whistles, it maybe good for those that wants a back up phone. 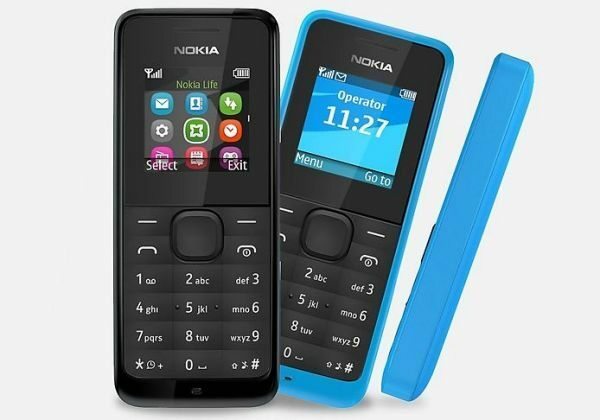 This is a simple phone that can make and receive phone calls as well as allowing users to send and receive text messages, this Nokia 105 also comes with an FM radio, flashlight, Dual band EGSM 900/1800, 1.45-inch 65k Colour TFT Display, 8MB ROM memory, as well as being splash and duct proof. The Nokia 105 will offer users up to 35 days standby time and up to 12.5 hours talk time, unlike most smartphones that need charging much more. The handset is simple but yet elegant enough not to fall under the “UGLY” category, this is a form factor handset for those without the pennies, or for those wanting a second quick and easy back-up phone. This is no smartphone and to be frank not even a low-end phone, it is a 15-euro handset that has nothing other than the basics that also includes a speaking clock. We know many phone users still using old-fashioned beat up phones, they do not want the gimmicks, and they just want a phone. Yes we laugh when we still see people with these phones and especially when they say, “What is an app?” good on you Nokia for bringing the Nokia 105 in the public eye. Please watch the Nokia 105 in the video provided below, for more tech specs etc please visit Nokia. Today we also reported that the Nokia Lumia 520 and 720 was announced at MWC 2013, read more about them here.